Andrew Luck spent three offseasons fighting his way back from injuries. Now he can reap the reward. After returning to the field, making it back to the playoffs, regaining his Pro Bowl form and collecting The Associated Press NFL Comeback Player of the Year Award, a healthy Luck now intends to take a rare and well-deserved break from . How Luck will spend his downtime is unclear. Peyton Manning broke the monotony with hunting trips. Brett Favre worked on his ranch. Tom Brady won a Super Bowl after changing last year’s offseason routine to spend more time with his family and less on . They all learned throwing more balls doesn’t necessarily make a better quarterback. Matt Hasselbeck, a three-time Pro Bowler who backed up Favre and Luck during his 17-year career, became a believer. So after hearing a story about Manning meeting a former U.S. president one offseason, Hasselbeck accepted an offer from assistant coach Clyde Christensen to spend time with a Navy admiral. “He talked to us in our quarterback meeting one day about protecting the football because we’d had some issues and he used this analogy of what they tell Top Gun pilots,” Hasselbeck said. “It was basically that you have this great plane you get to fly and it does not belong to you. It belongs to the government, it belongs to the people. Clyde said we should take the admiral up on spending some time with him. So I did that one offseason. It was a message Hasselbeck relayed to Luck after joining the Colts in 2013. But it was a hard sell to a young workout warrior with the pressure and expectations of a No. 1 draft pick. While Luck enjoyed vacationing in Europe, where he spent part of his childhood reading books, following soccer and riding bikes, the desire to improve drove him to work out. In time, Hasselbeck’s message sank in. “When we were first teammates, I told him there are going to be some years that are fun and they’re easy and you’re healthy the whole year,” said Hasselbeck, who now works for ESPN. “There’s going to be other years when it’s miserable and you’re dealing with something the whole year and you’re in the training room all the time. You’re there early and you’re there late and you’re in pain and you’re on drugs. Luck’s good year came with 16 starts for the first time since 2014, producing career highs in completions, attempts and completion percentage. He finished second to Patrick Mahomes in touchdown passes, helped the Colts end a three-year playoff drought and found a better balance between life and football. Still, taking a break won’t be easy. 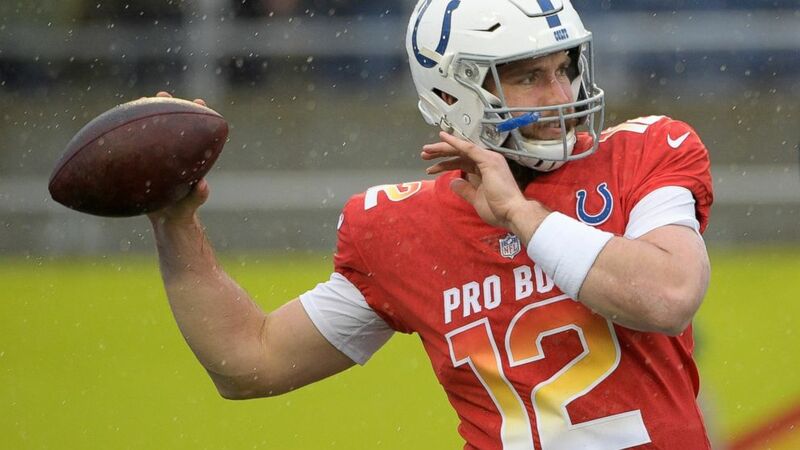 The difference is the 20-month gap between regular-season games following surgery on a partially torn labrum and three successive injury-plagued offseasons have changed Luck’s perspective. He never missed a chance to explain how much fun he had last season and acknowledged things felt different after a season-ending loss to Kansas City. Instead, he threw for a week leading up to the Pro Bowl and attended the NFL’s honors banquet last week. Luck hasn’t said if he will work out again at Stanford, his alma mater, but acknowledged he’ll continue to work with Tom House, the former Major League Baseball pitcher who has helped him in the past. But the Colts remain convinced the best prescription for Luck is rest.